With Discraft's exclusive Supercolor stamping process, your custom discs can take on any look that your imagination can dream up. Supercolor designs can include graphics, logos, photos... anything! Available for disc golf on the Buzzz, also on UltraStars and Mini-Stars. 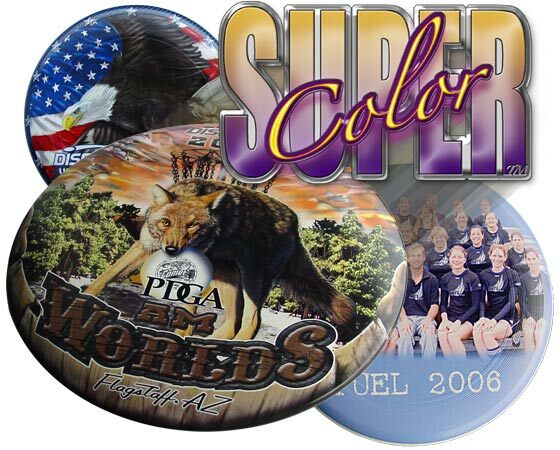 Supercolor designs are the new standard for clubs, tournaments, trophies, weddings, promotional giveaways and other special events. They look great, and fly even better. Remember to order early: turnaround time on Supercolor orders is six weeks. How Does Custom Ordering Work? Review your printing options and decide which process (hot stamping or Supercolor) is right for you. Fill out a custom order form. We will respond within 3-4 business days with your quote. While you are waiting, please carefully read our art specifications to ensure your art will conform to our printing processes. Once you have your quote, send us your art for a compatibility review. We will finish processing your order once art is approved and payment is received. The time between sending your quote request to receiving your discs is typically 4 to 6 weeks. Rush orders are often possible. This can vary depending on which printing process you choose. See custom golf disc availability for the most recent model availability. If you are having trouble finding somebody to create your art, the Discraft Art Department can turn your concept into a killer design at a low cost. Supercolor: 50 discs total, 50 discs per model.